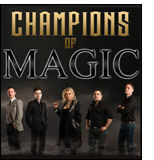 Champions of Magic 2015 tour dates announced: "Champions of Magic is heading back on the road from February to April 2015, including an extended tour of Scotland, the first time the show has headed North of the border. Witness stunning illusions including disappearances, teleportation, levitation and a heart stopping finale that sees one performer walk through the spinning steel blades of a giant industrial fan, all presented with lighting and pyrotechnics to rival the biggest arena productions." 'World-class illusionists... you will have to go to see what happens' Jersey Evening Post. 'Spectacular family show... take a seat and prepare to be astounded, astonished and amazed' Heart FM. Starring: Young and Strange, Fay Presto, Alex McAleer and Edward Hilsum.